Potato salad has always been one of our favourite side dishes, so much so that we often eat it just as the main course! 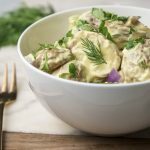 With red onion, celery and fresh dill our vegan potato salad is sure to be a hit at any party or gathering. We prefer a bit of crispiness to our potato salad so instead of boiling the potatoes, we roast them. You can roast your potatoes with some garlic cloves and fresh herbs to give this dish a whole new layer. Potato salad has always been one of our favourite side dishes, so much so that we often eat it just as the main course! 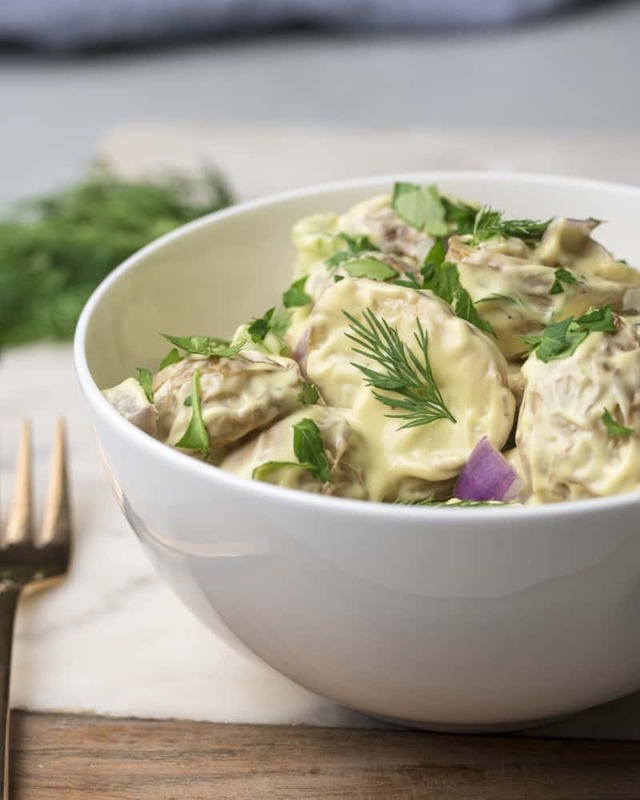 With red onion, celery and fresh dill our potato salad is sure to be a hit at any party or gathering. Preheat your oven to 200°C (400F). Add the halved baby potatoes to an oven proof dish and drizzle with the olive oil and sprinkle with salt. Rub the olive oil and salt in and roast in the preheated oven until golden and crispy (roughly 45 minutes). While the potatoes are roasting, combine the vegan mayo, dijon mustard, salt and pepper to make the potato salad cream. Cover and chill in the refrigerator until the potatoes are done roasting. After the potatoes are done roasting, leave them to cool for about 30 minutes. 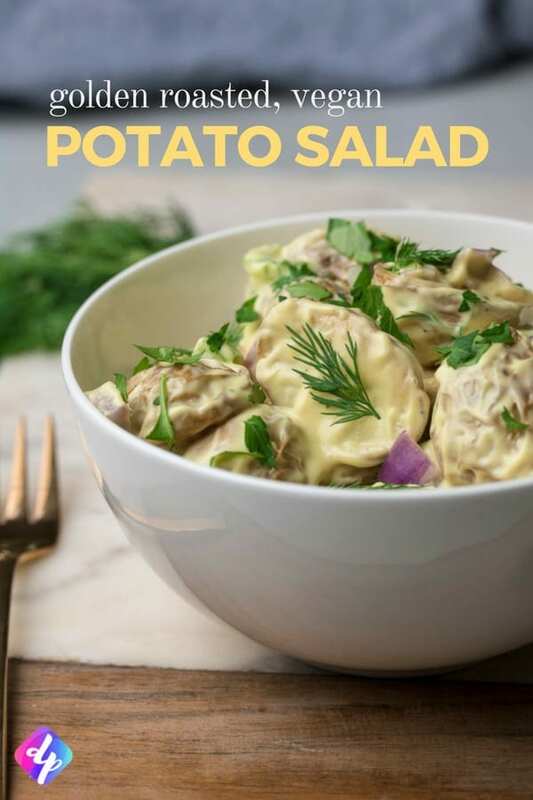 Once the potatoes are cool, add them to a bowl along with the prepared potato salad cream, chopped red onion and fresh dill. Garnish with fresh parsley and serve! Keep your potato salad covered, in the and it will stay fresh for 3-6 days. I find the longer it stays in the fridge the better the flavours combine! Now for the dessert (my favourite course! ), why not give our no-bake blueberry cheesecake a try?